Baby Bath Tub:JST manufacture baby bath tubs for kids. 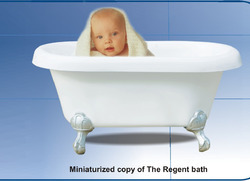 Miniaturized copy of JST The Regent bath. A baby bath can help you to give your baby a safe and comfortable bath. There are many different designs available. Some baths have backrests and headrests to give your baby support while you wash him. Other baths are specially curved to cradle your baby. Our company is the foremost in offering Baby Shower Tub to the clients. We are one of the prime manufacturers, exporters and suppliers of a broad collection of Baby Bath Tub. This bath tub is available with us in different designs, colors and sizes as per the requirements of clients. 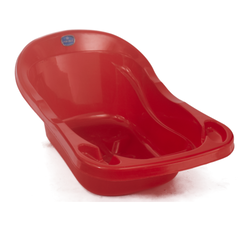 We are engaged in offering a superior quality Plastic Baby Bath Tub, which are made from crack resistant material. The offered range of Baby Tub is known for high durability, sturdiness, dimensionally accuracy, superior quality and long lasting life. Enriched by our vast industrial experience in this domain, we are into Baby Bath Tub. We are one of the best organizations in the market, involved in offering a wide collection of Baby Bather to the customers. We are the remarkable entity, engaged in offering a superior range of Pink Baby Bath Tub to our valued clients. Owing to its beautiful design and durability features, it is widely acknowledged in the market.